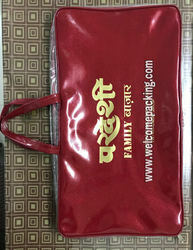 Offering you a complete choice of products which include lehenga and blanket packing bags, lehenga packing bags, single lehenga cover, lehenga packaging bags, fancy cover for lehenga packing bags and pvc lahenga bag. Variety of Clear, Semi & Non transparent films to meet specific requirements of customers from different industries. Different accessories for Bag Closure such as: Polyester and PVC Zippers, Snap Buttons, Velcro Tapes, self sealing Adhesive Tapes and Hangers & Handles for carrying purposes. Variety of beading options (in stitching form only) such as: Vinyl, Non Woven, Clothing, Rexine, fabrics, plastic wires & metal frames etc. Insert pockets to store Insert Cards and Labels etc. Backed by the sound experience of this industry, we have been able to offer an unmatchable assortment of PVC Lehenga Bag. 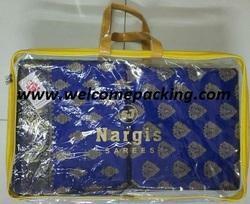 Offered bag by us is widely demanded in the market in order to carry a blanket. 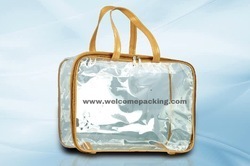 In line with the desires of our clients, we offer this bag in a wide range of sizes and other allied specifications. Clients can buy this bag from us at affordable prices. 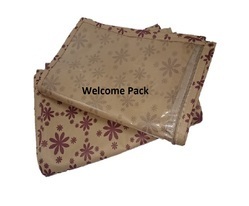 Beige premium quality printed Saree Shirt Garment Cover Storage Bag With Zip. We are identified as one of the leading names in the market engaged in providing a wide range of PVC Lehenga Bag to our valued clients. Furthermore, we offer these products to our patrons in numerous sizes. 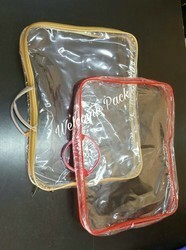 We are a prominent manufacturer of superior quality Lehenga packing bag which is fabricated using best grade raw material which is sourced from the most trustworthy supplier of the market. Our offered array is available in varied sizes and specifications as per the choices and preference of our esteemed customers.